"I bought 2 and plan to get a few more as gifts. This is a book that you can't find anywhere else. With Lyme's Disease becoming more of an issue every year, many have been discouraged and left hopeless with this disease that they have to live with if they didn't get help right away from the beginning. Rebecca has put her heart and soul into this book and it obviously shows. Sharing from her heart and experiences is something every person affected with Lyme's can understand. I would encourage you to buy this affordable book not just for yourself, but for someone else." These words meant so very much to my little heart because this is such an answer to my prayers!! 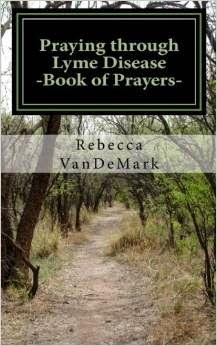 THANK YOU so much to ALL of you that have purchased the book, have sent me encouraging emails, and have passed this book on to others fighting Lyme Disease. If you have read the book would you mind writing a review? As a new author this type of thing helps spread the word to others! Thank you so much!! Most importantly, my prayer is that every person reading this book will be drawn closer to the heart of God. Would you please join me in that prayer? Thank you again! If you are looking to purchase the book you can buy it where books are sold and find it on Amazon HERE. Aww thank you so much Dani!! That is so incredibly sweet of you!! Thank you for taking the time to leave such a sweet and encouraging comment!!! How are you doing?